In the CO2 series we looked at the effect of CO2 without climate feedbacks. The “answer” to the doubling of CO2 was a “radiative forcing” of 3.7W/m^2 and an increase in surface temperature of about 1°C. There are many ways to introduce this problem. We’ll start with the great Ramanathan, who is always worth reading. 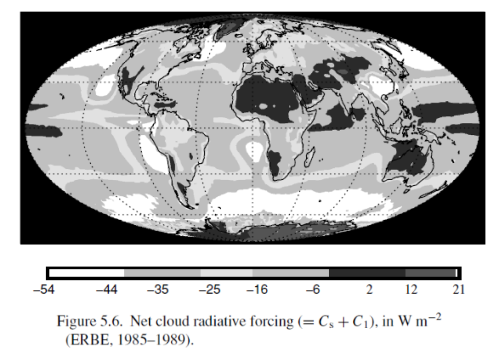 This article discusses the ideas in the chapter The Radiative Forcing due to Clouds and Water Vapor (by Ramanathan and Inamdar) from Frontiers of Climate Modeling by Kiehl and Ramanathan (2006). Note that the link allows you to download the chapter. Well worth reading. And if you have questions about whether CO2 can influence temperature or whether the inappropriately-named “greenhouse” effect exists, take a look at the CO2 series (and ask questions there). The reason is that absolute humidity is less realistic than relative humidity – and the concept of relative humidity leads to positive feedback. Why positive feedback? Higher concentrations of CO2 lead to increased radiative forcing and so the surface and tropospheric temperature increases. As a result – under constant relative humidity – the amount of water vapor in the troposphere increases. Water vapor is a greenhouse gas and so further increases “radiative forcing”. One of the questions that come to people’s minds is whether this leads to thermal runaway. The answer, when considering the “extra” effect from water vapor is no, and this is because there are also negative feedbacks in the system, especially the fact that radiation (a negative feedback) increases as the 4th power of absolute temperature. But enough of trying to think about the complete solution before we have even begun. Let’s take the time to understand the thinking behind the problem. Clouds are one of the toughest problems in climate science, and as a result, many models and experiments differentiate between cloudy and clear skies. The ERBE experiments clarified the main effects from clouds. Clouds reflect solar radiation by 48 W/m2 but reduce the outgoing longwave radiation (OLR) by 30 W/m2, therefore the average net effect of clouds – over this period at least – is to cool the climate by 18 W/m2. Note that these values are the global annual average. I’ll try and keep any maths to a minimum, but a few definitions are needed.. if you don’t like seeing equations the explanations in the text mean you haven’t missed anything essential. The first term on the right-hand side of the equation, σTs4, is just the radiation from the earth’s surface at a temperature of Ts (the Stefan-Boltzmann equation). So the radiation from the earth’s surface less the “greenhouse” effect is the amount of radiation that escapes to space. G is made up of the clear sky “greenhouse” effect, Gclear, and the (longwave) effect of clouds, Gcloud. Now as we move from the hotter equator to the colder poles we would expect Gclear to reduce simply because the surface radiation is much reduced – a 30°C surface emits 480 W/m2 and a 0°C surface emits 315 W/m2. A large proportion of the changes in the “greenhouse” effect, Gclear, are simply due to changes in surface temperature. This parameter simply expresses the ratio between the clear sky “greenhouse” effect and the surface radiation. The variations in this normalized value reflect changes in atmospheric humidity and lapse rates (the temperature profile up through the atmosphere). See especially CO2 – An Insignificant Trace Gas? Part Five for a little more illumination on this. The global average value for Gclear = 131 W/m2 and for gclear = 0.33 – i.e., the atmosphere reduces the radiation escaping to space by 33%. Water vapor decreases from equator to pole due to temperature (lower temperatures mean lower absolute humidity), and increases over ocean compared with land (because of the availability of water to evaporate). If we can see that the “greenhouse” effect is strongly influenced by water vapor, we want to know how water vapor changes in response to surface and tropospheric temperature changes. To make sense of this section it’s helpful to follow some maths. However, I recognize that many people would rather skip any maths so this is in the last section for reference. For the tropics, Ts peaks in March/April, while for 90°N–90°S, Ts peaks in July. We can qualitatively interpret the phase of the annual cycle as follows. 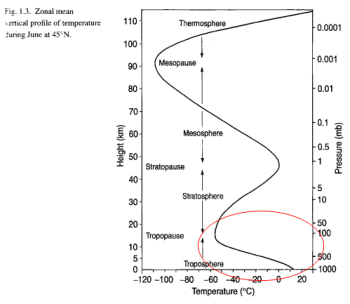 The tropical annual cycle is dominated by the coupled ocean–atmosphere system and as a result, the temperature response lags behind the forcing by a maximum of about three months (π/2); thus, with the solar insolation peaking in December 21, the temperature peaks in late March as shown in Figure 10. The extra-tropical and global annual cycle is most likely dominated by the hemispherical asymmetry in the land fraction. During the northern-hemisphere summer (June, July, and August), the large land masses warm rapidly (with about a one month lag) which dominates the hemispherical and global mean response; however, during the southern-hemisphere summer, the relatively smaller fraction of land prevents a corresponding response. Thus, the globe is warmest during June/July and is coldest during December/January. What can we make of the correlation? Correlation doesn’t equal causation. The best fit is a phase lag of less than a month which implies that water vapor and gclear are not driving Ts – because the feedback in that case would require more than one month. The converse, that Ts is driving water vapor and gclear, is much more likely because convective time scales are very short. Of course, this is a deduction from a limited time period. One of the key relationships in understanding feedback is the change in Gclear with Ts (mathematically we write this as dGclear/dTs – which means “the rate of change with Gclear as Ts varies “). For reasons briefly outlined in the maths section, if dGclear / dTs > 2.2 it implies positive feedback from the climate. When the data is plotted from the ERBE data we can see that in the tropics the value is the highest, much greater than 2.2, and when the whole globe is included the value reduces significantly. However, the value for the whole globe still implies positive feedback. In this last graph we see the feedback value for progressively wider latitude ranges – so on the left we are only looking at the tropics, while over on the right (90°N to 90°S) we are looking at the entire planet. This helps to see the contribution from the tropics progressively outweighed by the rest of the plant – so the important point is that without the strong effect from the tropics the feedback might well have moved to negative. The feedback doesn’t change between clear sky and all sky, implying that the cloud feedback doesn’t impact the climate system feedback (on these timescales). However, our results do not necessarily confirm the positive feedback resulting from the fixed relative humidity models for global warming, for the present results are based on annual cycle. We need additional tests with decadal time-scale data for a rigorous test. 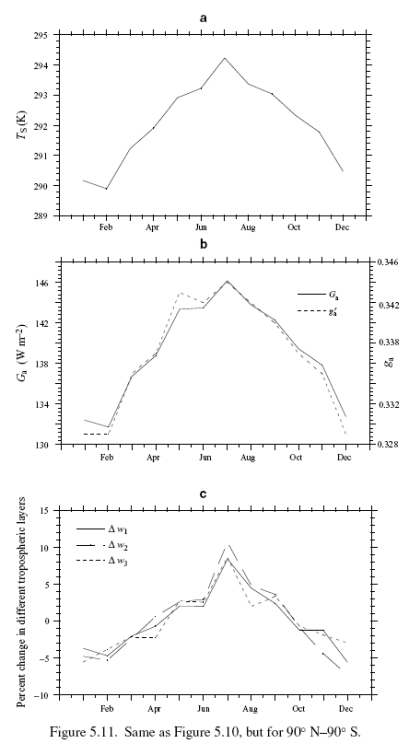 Nevertheless, the analysis confirms that water vapor has a positive feedback effect for global-scale changes on seasonal to inter-annual time scales. He also comments on other work (including Lindzen) that finds different results for the relative important of water vapor in different vertical sections of the troposphere. Hopefully, we will get the opportunity to consider these in future articles. This is a big subject which has lots of different perspectives, and only one is developed here. Therefore, I hope that this is the first of many articles on the subject. It should be helpful to see the approach and one way of interpreting the data. There is a theoretical framework behind the concepts, which can be seen in Ramanathan’s paper from 1981: The Role of Ocean-Atmosphere Interaction in the CO2 Climate Problem. (You can find a free copy online). It’s quite involved but perhaps some of the concepts from this paper will be in one of the next posts in this series. I’ll follow the notations from the chapter reasonably closely. But I think they are confusing so I have changed a few of them. And if you do want to understand the maths it’s definitely worth taking a look at the more detailed explanations in the chapter to understand this beyond the surface. now for Ts changing with no lapse rate feedback and no water vapor feedback, dFclear/dTs = 3.3 Wm-2K-1 (from Ramanathan 1981, see ref above in conclusion). And from , if dGclear/dTs > 5.5 – 3.3 = 2.2 then there is positive feedback. Very soon we will finally get to a post with an interesting subject like climate feedback.. But first, just a few basic examples, following on from the recent post: Intelligent Materials and the Imaginary Second Law of Thermodynamics, which in turn followed on from a few before that. In the last post one of our frequent champions of the imaginary second law of thermodynamics acknowledged an important point. We had previously agreed that radiation from a colder body does reach a hotter body. The question was about whether the hotter body actually absorbed the energy from the colder body. Specifically, about the “absorptivity” of this hotter body for “irradiation” received from the colder body. With the important question being about whether a 0°C surface treats radiation from the +10°C body any differently from the radiation from the -10°C body. Our “imaginary second law” champion did acknowledge that, for example, 10μm radiation from a -10°C body is treated no differently from 10μm radiation from a +10°C body. That is, the absorptivity, or proportion of radiation absorbed, is the same for any given wavelength regardless of the temperature of the source body. Armed with this “consensus” we can examine a few further ideas. So it will be interesting to see how the champions of the imaginary second law respond. Of course, it’s important to note that we only have one signed up to this “consensus” (about hotter bodies absorbing radiation from colder bodies). The imaginary second law movement isn’t a monolithic voting block. Others may not agree, as in Radiation Basics and the Imaginary Second Law of Thermodynamics where a new advocate championed the idea that the radiation from the colder body never reaches the hotter body, claiming that the radiation was cancelled out and the measurements of radiation reaching the hotter body were fraudulent. Well, interested parties can follow that fascinating story..
Why space? Well, space is a vacuum and this simplifies our thought experiments because there is no conduction or convection of heat, and this only leaves radiation as the mechanism for the transfer of heat. 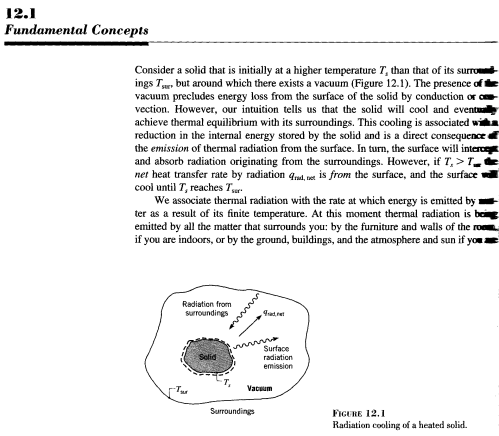 So in the first example, we consider a sphere which has a surface temperature of 273K (0°C) and no source of heat, which is left in space to cool down. Perhaps the sphere was previously heated up by a nearby star which has been “turned off”, perhaps it had its own source of heat. It’s not important. The conductivity of this sphere is very high – so all points on and within the sphere are at the same temperature. This is just to avoid the complexities of heat conduction vs time within the sphere, which doesn’t add anything to our example. The radius of the sphere = 10 m, so surface area = 1,256 m2. (A=4πr2). The sphere is a “blackbody” which means that it a perfect absorber of radiation (nothing reflected) and consequently a perfect emitter of radiation. And the last point is simply to identify the heat capacity of the sphere – which is 1×106 or 1,000,000 J/K. The shape of the temperature curve is probably not surprising to anyone. Obviously the temperature will decrease – because the body is radiating heat with no incoming radiation to balance out the loss, and there is no internal source of heat. Also you can see that the rate of change of temperature is reducing. This is because the body radiates according to the 4th power of temperature and as the temperature gets lower less heat is radiated each second. At time infinity the temperature will be zero (or the background temperature of the universe). The first example was probably uncontroversial. Now let’s look at two bodies in space in proximity to each other. 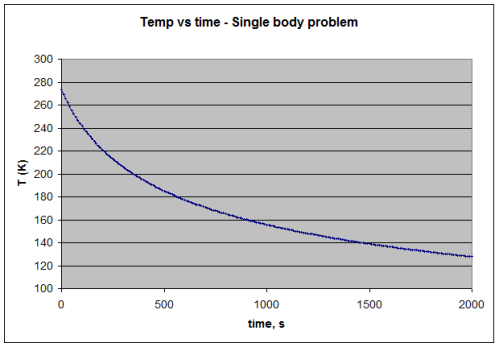 In this example the starting point is the same for the first body (which goes by the exciting name of “Body 1”), and the second body (not to be outdone, known as “Body 2”) is identical except for the fact that it starts at a temperature of 263K (-10°C). The distance between the center of the two bodies is only 30m – remember that the radius of each is 10m – so therefore there is only a 10m gap between the closest points. In fact, this creates a complexity that we will ignore in the calculation of incident radiation. See Note 1 at the end. Body 1 radiates and a small amount of this radiation is incident on Body 2. Body 2 radiates and a small amount of this radiation is incident on Body 1. Now Body 2 is initially colder than Body 1 but at least from one “imaginary second law” advocate we have agreement that Body 1 will absorb this radiation (according to its absorptivity, which in this case = 1, i.e., 100% of incident radiation is absorbed). See note 2 for the simple maths involved. There’s probably nothing very surprising in this graph. T1 is the temperature of Body 1,T2 for Body 2. Probably not surprising for most people that in the presence of another body radiating, Body 1 has a slower decrease in temperature. This is just a consequence of the first law of thermodynamics – the conservation of energy. Energy can’t just disappear. We will see what the advocates of the imaginary second law have to say about this one. Notice as well that the colder body is reducing the rate of heat loss from the hotter body but there is no perpetual motion machine. At time infinity they are both at absolute zero (or the background temperature of the universe). Now we come to the third example, and in this case Body 1 is being heated by a star. (Body 2 has exited stage left for this example). The radiation from the star incident on Body 1 is about 1260W/m2, which, with a radius of 10m means a total incident radiation of 395,570W – all of which is absorbed by Body 1 of course because it is a blackbody. Notice that the temperature doesn’t change – because the incident absorbed radiation is exactly balanced by the emission for a 273K body from its entire surface area. Everyone can feel quite comfortable about this example. The racy headline is fully justified in this exciting example. This fourth and final example is like the last example but Body 2 is “wheeled out” all of a sudden and placed the same distance away from Body 1 as in the earlier example (30m between the centers of each sphere). Body 2 starts off “pre-cooled” to 263K. Body 1 and Body 2 are close together with the sun radiating totally on Body 1 and on 86% of Body 2 – because Body 2 is partly in Body 1’s shadow. 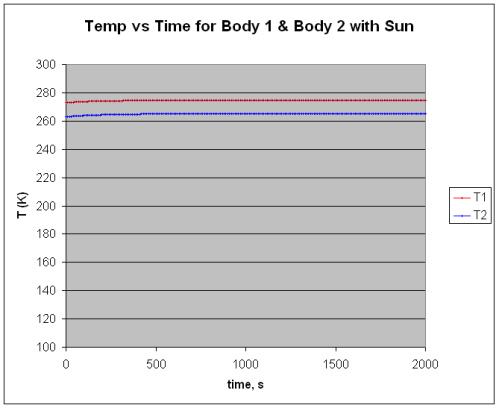 So the solar radiation on Body 2 = 340,718 W.
With only Body 1 basking in solar joy its surface temperature was 273K (0°C), but when Body 2 was wheeled in at a temperature of 263K (-10°C) we find that the surface temperature of Body 1 increases up to about 274.7K, a 1.7°C increase. And in the process Body 2 has increased from -10°C to -8°C. No surprises to most people – this is just a consequence of the first law of thermodynamics – energy can’t just vanish. So if radiation from a colder body is incident on a hotter body – and absorbed – it has to have an effect. Well, more radiation from Body 1 is absorbed by Body 2 than the reverse. The net is from the hotter to the colder. This is why Body 2 has a higher increase in temperature. So the real second law of thermodynamics is preserved. And if the sun turns off, both bodies will cool down to absolute zero (or the background temperature of the universe). So there is no perpetual motion machine. The reason the temperature increased was because we changed the conditions – added another body radiating energy. And because we cannot create or destroy energy it has to have an effect. No energy has been created. Now imagine the scenario that we arrive many years after the start – we see the sun and two bodies in a happy equilibrium. Someone points out that without the presence of the colder body (Body 2), Body 1 would actually be colder. All the advocates of the imaginary second law of thermodynamics have to do now is demonstrate what steps are flawed in these examples. Finally, shall we throw out the first law of thermodynamics or the imaginary second law of thermodynamics? When two bodies are separated by a very large gap (very large compared with their radii) the calculation of incident radiation is very simple – because the distance between any two points on the two spheres ≈ d.
When the gap becomes smaller the calculation becomes more challenging. This is because the two closest points are no longer separated by d but by d-2r (or more accurately d-2r ≠ d). So each “path” between the two bodies is somewhere between d-2r and d+2r. It’s not a difficult mathematical problem but it is a double integral that won’t add anything useful to the analysis. If anyone is concerned that the analysis is somehow invalidated – we can simply repeat the same analysis with the two bodies separated by a great distance, we will see the same effect but with a smaller magnitude. Alternatively, we could perform the actual double integral to confirm the true and accurate figure. This is left as an exercise for the interested student.. The calculations are each time step are very simple. Energy radiated per second for Body 1, Eout1 = σT4A – where A is the surface area, and T is the temperature of the body (this is for a blackbody where emissivity, ε =1). Likewise for Body 2. Proportion of radiation from Body 1 incident on Body 2 = 0.028 (= πr2/4πd2, where r is the radius of the body and d is the distance between the centers of the bodies) – see note 1, not particularly accurate unless d>>r). Likewise for the radiation from Body 2 incident on Body 1. 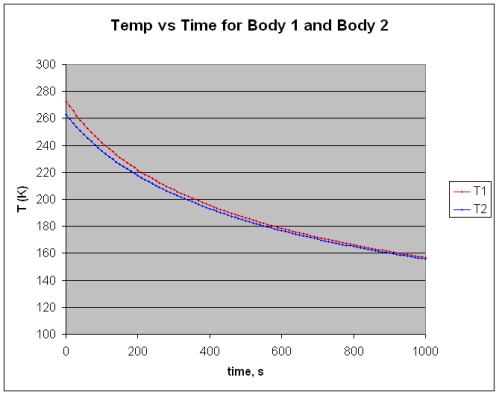 If Body 1 and Body 2 started off much colder, even at absolute zero the same equilibrium conditions are reached. In Radiation Basics and the Imaginary Second Law of Thermodynamics I covered a fair amount of ground because it started in answer to another question/point from a commenter. We all agree that the net effect of radiation between hot and colder bodies is that heat flows from the hotter to the colder body, but many people have become convinced that this means radiation from a colder body has no effect on a hotter body. Therefore, there is no room in this theory for the crazy idea that colder bodies have no effect on hotter bodies. To demonstrate the opposite, the interested student would have to find a flaw in one of the two basic elements of thermodynamics described above. And just a note, there’s no point reciting a mantra (e.g., “The second law says this doesn’t happen”) upon reading this. Instead, be constructive. Explain what happens to the emitting body and the absorbing body with reference to these elementary thermodynamics theories. One of our regular commenters has finally explained what happens. This was a great day of joy because in three other articles on this blog (The Imaginary Second Law of Thermodynamics, How Much Work Can One Molecule Do? and On the Miseducation of the Uninformed by Gerlich and Tscheuschner (2009)) and one on another blog the subject has been much discussed. What happens to radiation from the colder body when it “reaches” the hotter body? But I had never been given an answer – until now. (Note: the general consensus from the imaginary second law advocates – as much as I can determine – is that the colder body does emit radiation so at least there is agreement on the first step). Back to thermodynamics and electromagnetic radiation. Scienceofdoom and others think that the hot surface has no option but to absorb a photon from the cold surface. I think a lot of this radiation is in fact scattered from the hot surface and is not absorbed. “A Lot” is Not Absorbed? Before we dive into the fascinating topic of absorptivity and absorption, I hope people don’t think I am being pedantic for drawing attention to the fact that one of our most prominent advocates of the theory (the Imaginary Second Law) has actually failed to support it. If no radiation from the colder body is absorbed by the hotter body then the imaginary second law stands. That is, if any radiation emitted by a colder body “reaches” the hotter body and is absorbed by the hotter body then the colder body has transferred energy to the hotter body. The colder body has had “an effect”. It is absolutely in error. Which was wonderful to hear because up until now everyone else had simply ignored the question as to whether Incropera and DeWitt didn’t understand the basics of radiation (for reasons that are all too easy to imagine). I can’t be 100% certain what the imaginary second law of thermodynamics teaches but it has appeared up until now – from the comments by many advocates – that colder bodies have no effect on hotter bodies. How can it be that the first time someone explains what happens to the incident radiation they agree, at least in principle, with the rest of the world? We (the rest of the world) all think that cold bodies have an effect on hotter bodies. Perhaps more advocates can comment and vote on this idea.. There are a few basic concepts in traditional thermodynamics that are worth explaining, even though they might appear a little tedious. According to Kirchoff’s law, emissivity = absorptivity for a given substance at the same wavelength (and for some surfaces direction needs to be defined also). You have a particularly naive view of heat transfer. When a green plant absorbs some em radiation to make starch does it simultaneously emit the same radiation? You have not grasped the fact that if the absorption of 4um radiation was exactly balanced by the emission of 4um radiation the net effect would be zero. Which would shoot a massive hole in the case for AGW. I prefer to think of my understanding of physics as traditional rather than naive. So, a few basics need explaining so that readers can judge for themselves. Just a comment, as well, for new people looking into this subject. The basics often seem a little dull, but hopefully I can persuade a few to dig deep and work hard to get the very basics clear. I can promise unrelenting joy down the track as you realize that you understand more than most other people who had jumped ahead and are now writing confused comments.. (assuming this will give you unrelenting joy). Let’s look at snow in sunlight and use it to “shed light” on a dull subject. We will focus on the snow being heated by sunlight and ignore terrestrial radiation – even though the material will also be heated by terrestrial radiation. This is because we aren’t trying to work out a complete energy balance for this particular material, just illustrating the important points. 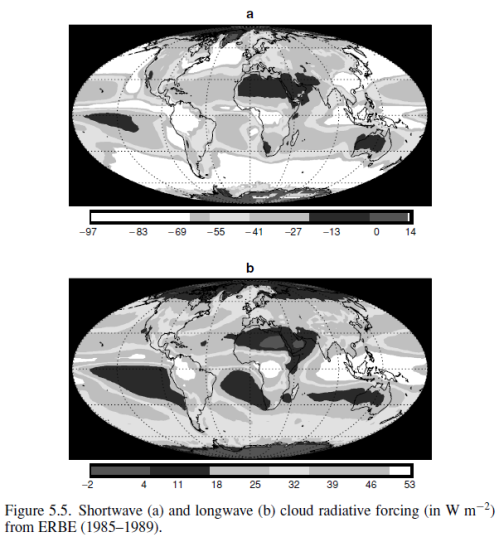 This shows how the radiation incident on the snow varies with wavelength. The actual amplitude is dependent on the time of day, the latitude, the amount of clouds, and so on. The important point is that radiation from the sun peaks at a wavelength of around 0.5μm and above 2μm is much reduced (91% of solar radiation is below 2μm). Therefore, to find out how much radiation the material actually absorbs we need to know the absorptivity at these wavelengths. The scale on the left is reflectivity and on the right (harder to see) is absorptivity from 1.0 at the bottom up to 0.0 at the top. Absorptivity = 1-reflectivity. 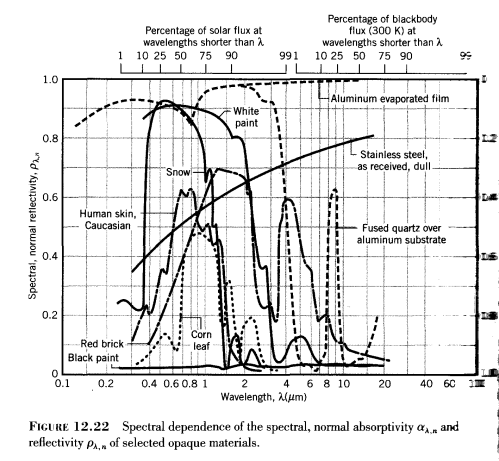 Absorptivity is a function of wavelength and is the proportion of incident radiation at that wavelength which is absorbed. Let’s take snow as an example. Sunlight on snow will be mostly reflected and not absorbed. That’s because the incident sunlight is mostly between 0.2μm to 2μm – and if you check the reflectivity/absorptivity graph above you will see that the absorptivity is quite low (and reflectivity quite high). Snow has a high albedo for sunlight – around 60% – 80% is reflected, meaning only 20%-40% is absorbed. Now let’s consider the snow at a temperature of 0°C (273K). How much thermal radiation does it emit? The first thing you notice is that the snow is radiating at completely different wavelengths to the solar radiation. The solar radiation is mostly between 0.2μm to 2.0μm, while the snow is radiating between 5μm and 50μm. So we need to know the emissivity between these wavelengths to work out the actual emission of radiation from the snow. Emissivity is a value between 0 and 1 which says how close to a blackbody the material is at that wavelength. Emissivity is equal to absorptivity – see the next section – so we can just look up the absorptivity instead. 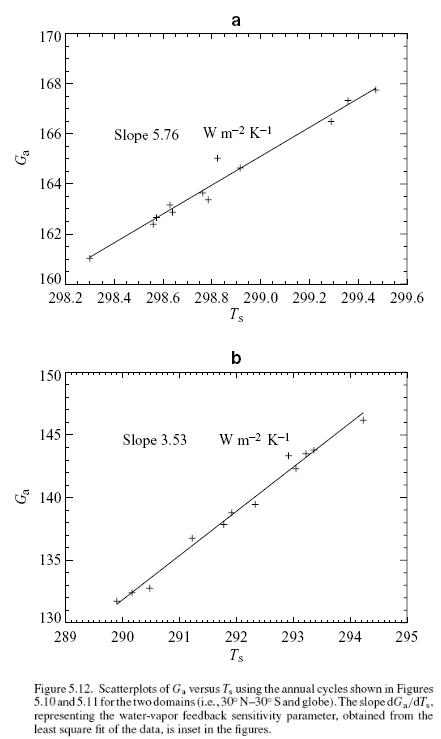 In the graph from Incropera the absorptivity of snow at higher wavelengths is not shown. But it’s clear that it has changed a lot (and in fact absorptivity is very high – and reflectivity very low – at these higher wavelengths, which climate scientists call “longwave”). Kirchoff’s law says that emissivity = absorptivity as a function of wavelength – and sometimes direction. That is, these two intrinsic properties of any material have the same value at any wavelength. (The derivation of this formula isn’t something that will be discussed here). That’s because emissivity is not the same as emission. And absorptivity is not the same as absorption. Of course, if a body is only gaining and losing energy by radiation (i.e., no conduction or convection), and the body is not heating up or cooling down then absorption will equal emission. This is due to the first law of thermodynamics or conservation of energy. But if absorption increases, the body will heat up until the new value of emission balances the increase in absorption. However, the absorption might be in one wavelength range and the emission in a totally different one. It’s not so difficult to understand, but it does require that you grasp hold of the basics. So (digressing) back to our commenter, it’s clear that his “reasons” for ditching Kirchhoff’s law weren’t because Kirchhoff was wrong..
And Kirchhoff’s law is very strong. It would need a monumental effort to overturn this part of thermodynamics basics. Reasonable people might expect that if over-turning Kirchhoff’s law is necessary to support the imaginary second law of thermodynamics, then this might imply that the imaginary law is, well, imaginary.. However, even stranger concepts are necessary to support the imaginary second law. Would Sir like to Absorb this Radiation? No? Very Good Sir, I’ll take it Back. Now that we have covered a few basics, perhaps some points might start to make sense. Let’s examine the idea that radiation from the cold surface is “not absorbed”, and see it in its comedic glory. Consider a surface of 0°C (273K). And now consider one body at 10°C radiating towards this 0°C surface. According to the imaginary second law advocates the radiation from the 10°C body is accepted. -10°C body. According to the imaginary second law advocates the radiation from the colder -10°C body is not accepted. And according to its strongest advocate, “it is scattered and not absorbed“. Notice the very similar radiation curves. And remember that absorptivity is simply a function of the material receiving the radiation. And ask yourself, how can the 0°C surface reflect the 10μm radiation from the colder -10°C body, and yet absorb 10μm radiation from the hotter +10°C body? 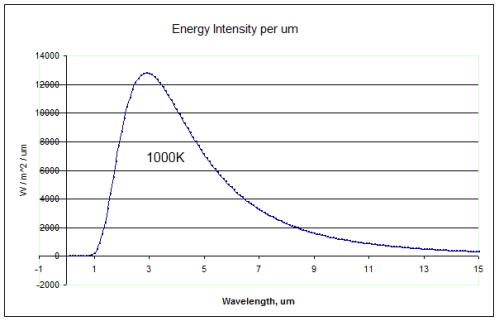 If the absorptivity at 10μm is 0.9 then it will accept 90% of the radiation at this wavelength from a +10°C body and 90% of the radiation at this wavelength from a -10°C body. It can’t check the menu and “send it back”. Likewise for each wavelength in question. It took many many requests to finally hear the explanation as to why radiation from a colder body has no effect on a hotter body. It’s not an explanation that will stand the test of time – except for the wrong reasons. It requires the advocate to believe amazing things about materials. Perhaps that’s why it took so long to get the answer. Yet more ridiculous ideas have recently been proposed. All in the cause of supporting the imaginary second law of thermodynamics. (These need considering in another post). Just a digression on the perpetual motion machine (because I don’t want to write a whole post on it). For some reason, perhaps the Gerlich and Tscheuschner miseducation, many confused people think that the absorption and re-emission of longwave radiation by the atmosphere constitutes a perpetual motion machine – and therefore this proves the inappropriately-named “greenhouse” effect can’t exist! Well, we all agree that there is no perpetual motion machine. But why would the atmosphere radiating towards the earth constitute “perpetual motion”? Think for a minute before answering, if you claim this. Right now the earth is around the same temperature it was 100 years ago and also 1000 years ago. Is that a perpetual motion machine – a machine that can’t exist? No. The sun warms the earth. And the sun is powered by internal reactions. Ok. So if the sun turns off what happens? The earth cools down. For people who think that the earth’s surface is radiating towards the colder atmosphere, and the colder atmosphere is radiating less energy back towards the earth, and the earth is absorbing this radiation.. we expect the same thing to happen when the sun turns off. The earth will cool down. Just a little slower. Well, the second law of thermodynamics is quite a basic one but misunderstood by many who think they are supporting it. For newcomers to this debate the approach I have taken is to take a specific example and ask the advocates of their theory how specific well-understood physical properties can possibly support their argument. Mostly I get no response. I have finally had two answers. One is considered here and it’s hard to understand how anyone can believe it. This is a very quick post to say thanks to John Cook of Skeptical Science for the recent “Woody Guthrie award for a thinking blogger” and especially the kind comments he made. I’m proud to be the recipient and already in a panic about the next recipient, apparently it’s up to me to decide. It is especially a problem in this divided world we live in. It’s easy to trade blows on blogs. It’s harder to understand a new point of view. Or to consider that a different point of view might be right. And yet, more constructive for everyone if we take a moment, a day even, and try and really understand that other point of view. Even if it’s still wrong, we are better off for making the effort. And sometimes others put forward points of view or “facts” that are obviously wrong and easily refuted. Pretend for a moment that they aren’t part of an evil empire of disinformation and think how best to explain the error in an inoffensive way. This is the long-promised eighth part of the seven-part series on CO2 basics. Part One introduced the idea of CO2 with some basic concepts. Part Three opened up the radiative transfer equations, not solvable on the pocket calculator. Part Five showed two important solutions. And Part Seven showed the current best solutions along with what “radiative forcing” actually means, and where the IPCC logarithmic formula comes from. The even numbers in the series shouldn’t be ignored either, especially Part Four which explained band models vs line by line (LBL) calculations. For CO2 – will doubling CO2 (from pre-industrial) levels add any more warming? And will doubling it again add any more? The answer already noted in earlier parts of this series is “yes”, but of course, everyone wants to know why, or what this means for the idea of “saturation”. Boringly, we will first look at some results from the radiative transfer equations. The RTE were introduced in Part Three – these are the full solution to the problem of absorption and emission by each “layer” of the atmosphere. The equations are challenging to solve because every absorption line for each gas has to be calculated, and a similar process goes on for emission of radiation by each layer in the atmosphere. It’s not some kind of mystery, it’s just very computationally expensive, so big computers and plenty of time are required. See Part Six for an example of theory matched up with measurement. This is from W.D. Collins (2006), reference below. (Interested students will note that the vertical axis appears to have the wrong units, I have emailed Prof Collins to ask about this – update, he has confirmed that the vertical axis is incorrect). 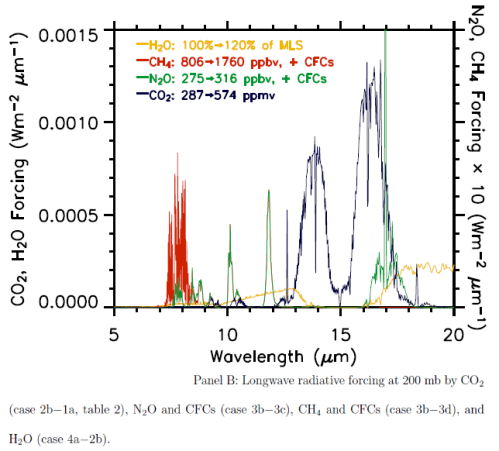 The blue line is the “radiative forcing” vs wavelength for CO2. The best way to explain why something called radiative forcing is used is that is a “standardization tool”. A simple explanation of radiative forcing is that it is the extra downward radiation at the tropopause before feedbacks from the surface and the lower atmosphere (the troposphere). You can see a little more on this concept in Part Seven. Now that’s over with – check out the graph. Red is a methane increase from pre-industrial levels to current levels, green is a nitrous oxide increase and yellow is the effect of a possible increase in water vapor. The important point is that for the increases for CO2 (blue), most of the increase in energy is not in the center of the 15μm CO2 band. It is interesting to see that the effect of the center of the CO2 band is not zero, although it is very low, but the main increase is in “the wings” of the band. This is the primary reason why doubling CO2 provides a significant increase in “radiative forcing” – or more heat into the surface and lower atmosphere. To demonstrate this result wrong simply requires the interested student to prove the RTE (radiative transfer equations) wrong, or the line by line database of absorption for CO2 wrong, or the particular methods of solving the RTE in these models wrong. So it could all be over here.. but of course there’s more to think about. By the way, the line by line method uses each individual absorption line stored in a huge database (like HITRANS), but the story is yet more complicated because each line has a definite width and a line shape, and these factors depend on the pressure and temperature. For example, each CO2 line is broader closer to the surface than it is high up in the troposphere. And the shape also changes. More on this at some later date, maybe.. The most important conceptual idea to understand is that the radiation from the surface which is absorbed by CO2 doesn’t just disappear. (The same applies to all “greenhouse” gases but I’ll stay with using CO2 as the prime example). We will consider the atmosphere in a number of vertical “layers”, stacked one on top of the other. CO2 absorbs energy, shares it with other molecules in the atmosphere and therefore that layer of the atmosphere heats up (see note 2). Some molecules, like nitrogen and oxygen, have no ability to absorb or emit longwave radiation (see CO2 – Part Two), but by collision with molecules like CO2 and water vapor they will share energy and be at the same temperature. 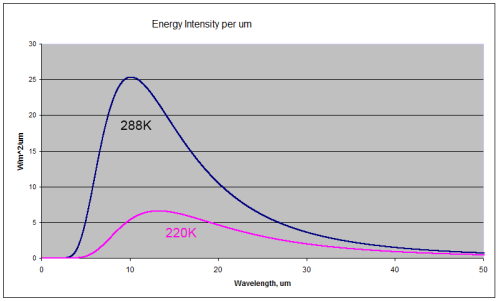 You can see that the radiation emitted by a 288K body is a lot higher than the 220K body (the total integrated across all wavelengths is greater by a factor of 3). You can also see that for the colder body the energy has shifted to longer wavelengths (the wavelength of maximum radiance has moved from 10.1μm for 288K to 13.2μm for 220K). A blackbody is a perfect radiator and absorber – so think of these curves as the ideal – the best that might be attained. 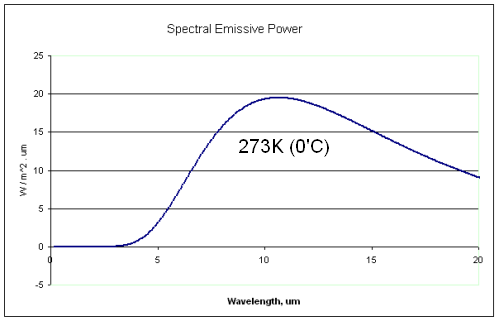 The surface of the earth is very close to a blackbody (the emissivity is close to 1) for longwave radiation – see The Dull Case of Emissivity and Average Temperatures. The atmosphere is not even close to being a blackbody. Atmospheric gases absorb and emit radiation at well-defined spectral lines. But the Planck function – as the curves above are called – tells us the “shape” that these spectral lines fit under. I’ve added “wavelength” under “wavenumber” on the horizontal axis for convenience. What this shows is the effective temperature of radiation for each part of the longwave spectrum. Take a look at the spectrum between 10-13μm. The radiation between these wavelengths corresponds to around 270K. Now look at the spectrum between 14-16μm. The radiation here corresponds to around 223K. That’s because there is not much absorption by the atmosphere in the 10-13μm spectrum, consequently most of the radiation from the surface goes straight out to space. By comparison, absorption is very high between 14-16μm so almost no radiation from the surface goes straight out to space. 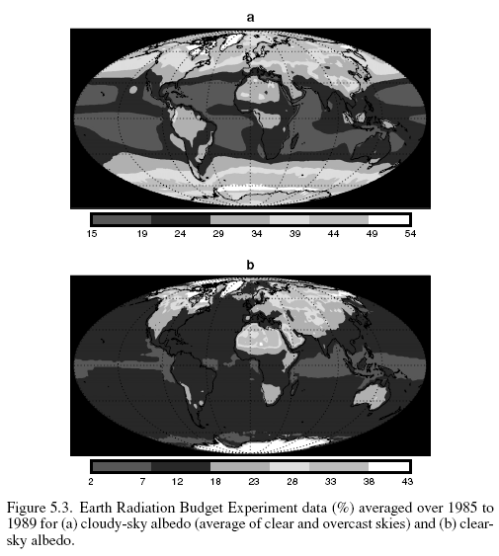 But – and here is the conceptual idea I want to get across – why is there any radiation between 14-16μm (measured by satellite)? Absorption by CO2 in the center of the 15um band is so strong that surely there should be no radiation – or nothing measurable.. This subject was covered in some detail in The Earth’s Energy Budget – Part Three, but essentially each layer of the atmosphere also radiates energy. If CO2 can absorb radiation at 15μm, it can also radiate at 15um. But it radiates according to its temperature. 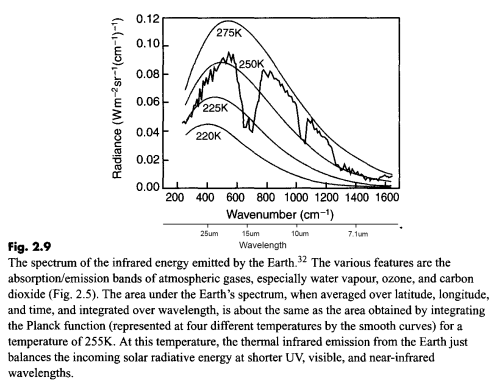 So when you see the measurement by satellite of the 15μm band reflecting a temperature of 223K you know that the bulk of the radiation was emitted by CO2 at a temperature of 223K (-50ºC). How does all of this relate to “saturation”? 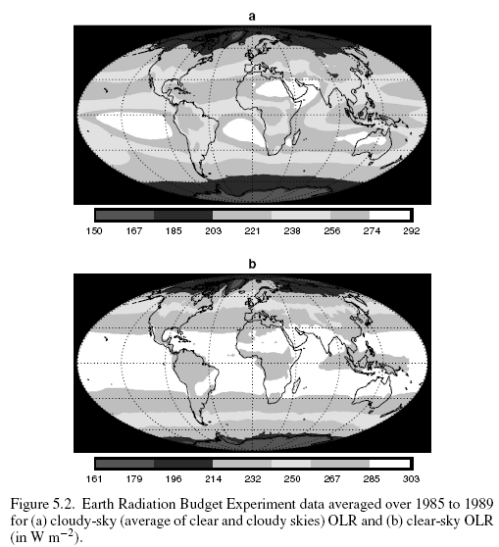 One way of thinking about the absorption and re-emission of 15μm radiation is like this – if the 15μm band is already radiating from the coldest part of the atmosphere, then increasing CO2 will have no effect on the earth’s energy balance because even if the 15μm band radiates from higher up, it won’t get any colder and, therefore, the amount of radiation at this wavelength won’t be decreased. But this is just in the center of the 15μm band. As we saw from the detailed line by line calculation in the paper by Collins, the bulk of the reduction in outgoing radiation is from 13-14.5μm and from 15.5-17μm. You can play around with these ideas by using the Modtran model. It uses band models (not line by line calculations) but band models give reasonable results. What is interesting is to increase the amount of CO2 and (looking down from 70km) see what effect takes place at 15μm – not much in the center of the band – for the reasons already explained: the atmosphere doesn’t get any colder. However, you will notice that the width of this heavily saturated band increases – as with the more accurate treatment by Collins at the beginning of the article. There is a simple model which is worth looking at by Barton Paul Levenson. What it demonstrates is that if you take a gas which absorbs across all longwave (>4μm) wavelengths, then even if this gas totally absorbs all radiation in the lower part of the atmosphere, adding more of this gas will still increase the surface temperature. This is for the simple reason that the incoming solar energy at the top of the atmosphere must be balanced by energy leaving from the top of the atmosphere – otherwise temperature will increase (see The Earth’s Energy Budget – Part Two). And if one “layer” of the atmosphere totally absorbs it will still radiate energy to the atmosphere above. As the atmosphere gets thinner it will eventually be radiating out to space – and it’s at these levels (heights) in the atmosphere that adding more CO2 will reduce the outgoing radiation. And if the outgoing radiation is reduced then there will be more incoming solar radiation than outgoing longwave radiation and the surface/atmosphere will heat up. Take a look at his model. Fascinating as it is, I don’t think it answers the question of “saturation” or not by CO2 in the actual climate. The reasons are complex, but read on if you are interested.. This is because the center of the CO2 band (15μm) is already radiating from the coldest part of the atmosphere. Therefore, increasing CO2 can’t reduce the radiation from the 15um band – unless more CO2 can change the temperature structure by lifting the height of the tropopause which will result in a colder tropopause. In a climate with a “gray” absorber (one that absorbs equally across all wavelengths) an increase in this absorber would almost certainly change the tropopause height. Why? The tropopause is the point at which the atmosphere becomes optically thin and so radiation to space can take place from that point. Radiation is now more effective than convection at moving heat upwards through the atmosphere. So a climate model (even a more refined one with many layers) with a gray absorber will do as Levenson’s model predicts. 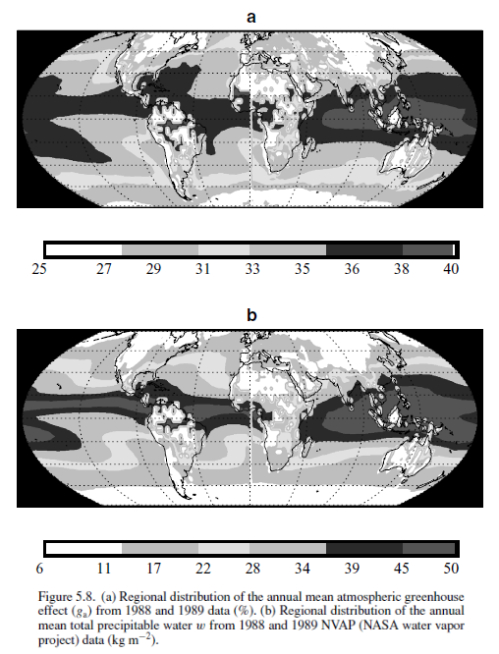 But a climate model with an almost transparent atmosphere in places will respond in less clear ways. Modeling the height and temperature of the tropopause is a difficult challenge and not something to get into here. Most of the confusion about “saturation” of CO2 comes from a lack of understanding of how both absorption and re-emission are linked in the atmosphere. The confusion also arises because atmospheric physics uses the term “saturation” to mean something more technically defined – that the atmosphere is “optically thick” at that wavelength. Two groups of people using the same word with a different (but related) meaning inevitably leads to confusion. The radiative transfer equations are the basic and proven equations for the absorption and radiation of energy in the atmosphere. Solving these equations using line by line calculations shows that most of the additional effect from more CO2 occurs in the “wings” of the band and not in the band center. Doubling CO2 from pre-industrial levels will lead to an increased “radiative forcing” of around 3.7 W/m2, and this part of climate science at least, is well understood. 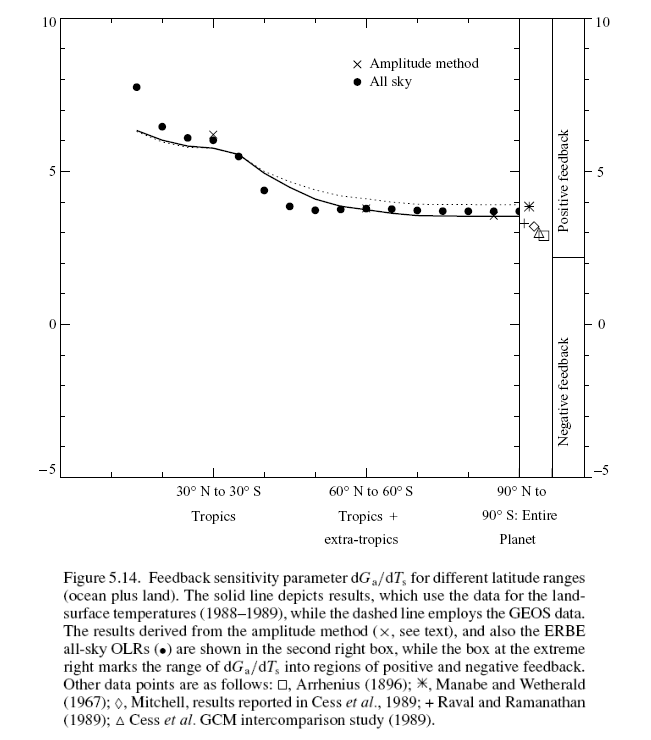 Demonstrating that this result is wrong requires over-turning the radiative-convective model which currently calculates outgoing longwave radiation (at top of atmosphere) and downward longwave radiation (at the surface) quite accurately compared with measurements. The mental models that many people have about saturation are not necessarily what is actually happening in the atmosphere. Note 1 – The specific conditions for this inter-comparison (by Collins et al) were slightly different from the standardized method of “radiative forcing” in that they didn’t include stratospheric adjustment – allowing the stratospheric temperatures to achieve equilibrium after the changes in trace gases. This has a small but significant effect on the overall total values of radiative forcing, but the results are useful because the graph of radiative forcing against wavelength is given, whereas most results are simply given as a W/m2 value. Note 2 – The subject of molecules of CO2 and water vapor absorbing energy and sharing this energy by collision with other molecules close by was covered to a limited extent in How Much Work Can One Molecule Do? This post will suffer from the unfortunate effect of too much maths – something I try to avoid in most posts and certainly did in The Imaginary Second Law of Thermodynamics. It’s especially unfortunate as the blog has recent new found interest thanks to the very kind and unexpected words of Steve McIntyre of Climate Audit. However, a little maths seems essential. Why? Some of the questions and triumphant points some commentators have made can only be properly answered by a real example, with real equations. It’s something I commented on in American Thinker Smoking Gun – Gary Thompson’s comments examined, where I explained that a particular theory is not usually a generalized statement about effects but rather a theory is usually a set of mathematical equations to be applied under certain well-defined circumstances. In The Imaginary Second Law of Thermodynamics the example was of a sun radiating into the nothingness of space, when a new star was brought into the picture. And the new star was hotter. So the question was, would the radiation from the colder star actually have an effect on the hotter star. Some Gerlich and Tscheuschner apostles thoughtfully spent some time trying to enforce some discipline about terminology of heat vs energy and whether radiation was a vector – but forgot to answer the actual question. Recently a commentator suggested that the real answer lay in considering two stars of equal temperature which were brought into proximity. As for the sun and the other star, only the sun at T10,000 will go up in T if you insert another T11,000 star, never mind how hard one thinks about it. Maybe this becomes obvious once you make the sun and the new star equally hot at T10,000 . They don’t become both hotter, which is what is predicted in the thought experiment. If the sun heats up the newly inserted star it should not matter really if that new star is at T11,000 or T10,000 does it? Unless all of the radiation is reflected it will increase the surface temperature. It might be 0.1K, 1K, 0.0001K – it all depends on the W/m^2 at that point – and the absorptivity at the wavelengths of the incident radiation. If that isn’t the case, then you have a situation where incident radiation is absorbed but has zero effect. Congratulations on sticking with it! I think you just discovered the endless source of energy we are all so desperately looking for. When you expect two equally hot bodies to keep heating each other, where is the limit? and could we not syphon off some off that excess heat. Which bring us to here. Many people gets confused around these basic points, which is why we need a post with some maths. The maths can prove the point, unlike “talk”. Conceptual understanding is what everyone seeks. I hope that this article brings some conceptual understanding even though it has a core maths section. Let’s first of all consider one “star” out in the nothingness of space. The star has a radius of 1000m (1km) and a temperature of 1000k (727°C). This temperature is identical all over the surface and is powered from internal stellar processes. This internal heat generation is constant and not dependent on any changes in surface temperature. We will also assume – only necessary for the second part of the experiment – that the thermal conductivity of this star is extremely high. This means that any radiation absorbed on one part of the surface will conduct rapidly around the surface of the star – to avoid any localized heating. 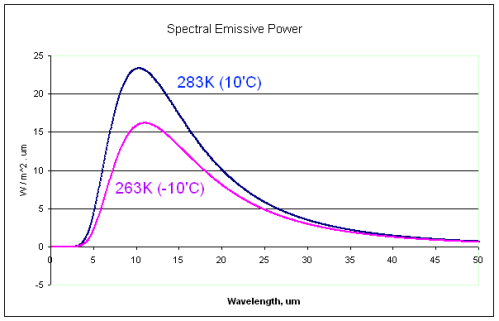 We also assume that its emissivity is 1 – it is a blackbody across all wavelengths. A few derived facts about this star, which we will give, in true mathematical style, the exotic name of “1”. If this is the thermal energy radiated, and star 1 is at equilibrium, then the heat generated within the star must also be this value. After all, if the heat generated was higher then the star’s surface temperature would keep increasing until steady state was reached. And from the Stefan-Boltzmann equation, T = 1,030K. Just an example, for illustration. So what happens when two identical stars are brought into some proximity? According to our commentator, nothing happens. After all, if “something” happens, it can only be thermal runaway. The only way we can find out is to use the maths of basic thermodynamics. For people who go into “fight or flight” response when presented with some maths, the conclusion – to relieve your stress – is that the system doesn’t go into thermal runaway, but both stars end up at a slightly higher temperature. Deep breaths. See a later section for “conceptual” understanding. We define E1 = the energy from star 1 before star 2 (an identical star) appears on the scene. And E1‘ = the energy from star 1 after star 2 appears on the scene. Consider star 2, radiating thermal energy. 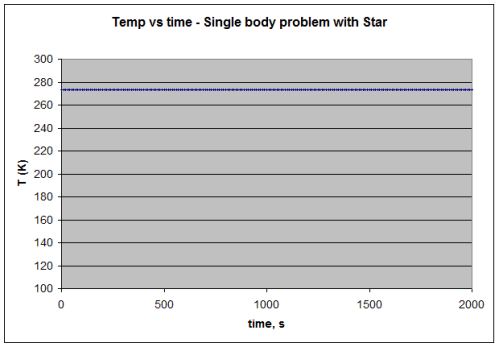 Some proportion of star 2’s thermal radiation is incident on star 1, which has an absorptivity (= emissivity) of 1. To calculate how much of star 2’s thermal radiation is incident on star 2, we use the very simple but accurate idea of a large sphere at radius d from star 2. This large sphere has a surface area of 4πd2. This value, b, will be a constant for given values of r and d.
So, our big question, when star 2 and star 1 are “wheeled in” closer to each other, at a distance d from each other – what happens? Well, some of star 2’s radiation is incident on star 1. And some of star 1’s radiation is incident on star 2. Will this – according to the crazy theories I have been promoting – lead to thermal runaway? Star 1 heats up star 2, which heats up star 1, which heats up star 2.. thermal runaway! The end of all things? Thermal Runaway? Or a Slight Temperature Increase of Both Stars? To work out the answer, it’s all about the maths. Not that the subject can’t be understood conceptually. It can be. But for those who are convinced this is wrong, “conceptual” just leads to “talk”. Whereas maths has to be disputed by specifics. When our two stars were an infinite distance from each other in the vastness of space, E1 = E2 – with the values calculated above. Now that the two stars are only a distance, d, from each other, a new source of thermal energy is added. Consider star 1. If this star absorbs thermal radiation from elsewhere, it must emit more radiation or its temperature will rise. If its temperature rises then it will emit more radiation. (See note 1 at end). This is simply showing mathematically what I have already expressed in words. So once new equilibrium is reached, we can calculate the new radiation value, and from the Stefen-Boltzmann equation, we can calculate the new temperature. These equations don’t tell us how long it takes to reach equilibrium, as we don’t know the heat capacity of the stars. But this is the new equilibrium for both stars. Note that there is no thermal runaway. The approach can now be subject to criticism. (So far no one has checked my maths, so it’s quite likely to have a mistake which changes the numerical result). I can’t see how there can be a mistake which would change the main result that no thermal runaway occurs. Or that would change the result so that no change in temperature occurs. No one wants to see this kind of “integral” (as the required maths is called). Least of all, me, I might add. Well, we’ll ignore the complexities and how it might change the result, just to get a sense of roughly what the values are. Not very exciting, and still no thermal runaway. Understanding this conceptually for most people won’t be too difficult. If you add energy to a body it will warm up. And it will emit more radiation. There will be a new equilibrium. Two bodies doing this to each other will also just reach a new equilibrium – they can’t go into thermal runaway. Of course, no one believes that thermal runaway will result, least of all the person who made the original comment – that was their whole point. They just didn’t realize that a new equilibrium could exist. The only way I can prove it is mathematically. Conceptual thinking is very valuable. Maths is very tedious. But because Gerlich and Tscheuschner have made such a huge contribution to the misunderstanding of basic thermodynamics it needs some extended explanation, including some maths. Many people have taken the statement about heat flow and imagined that thermal radiation from a colder body cannot have any effect on a hotter body. This is where they go wrong. A body with a temperature above absolute zero will radiate according to its emissivity (and according to the 4th power of temperature). This property is dependent on wavelength and sometimes on direction. The emissivity of a body is also equal to the absorptivity at these same wavelengths and directions. Absorptivity is the scale on the right from 1 at the bottom to zero at the top and is 1-reflectivity. (See note 2). Here you can see that snow is highly reflective at solar wavelengths (shortwave) and absorbs little radiation, whereas it has a high absorptivity at longer wavelengths (and therefore does not reflect much longwave radiation). The same goes for white paint. It reflects sunlight but absorbs terrestrial radiation. The equation for how much radiation is emitted by a body – εσT4 – does not include any terms for where the radiation might end up. So whether this radiation will be incident on a colder or hotter body, it has no effect on the radiation from the source. (See note 3). Similarly, when radiation is incident on a body the only factor which affects how much radiation is absorbed and how much radiation is reflected is the absorptivity of the body at that direction and wavelength. The body cannot put out traffic cones because the incident radiation has been emitted by a colder body. This is elementary thermodynamics. 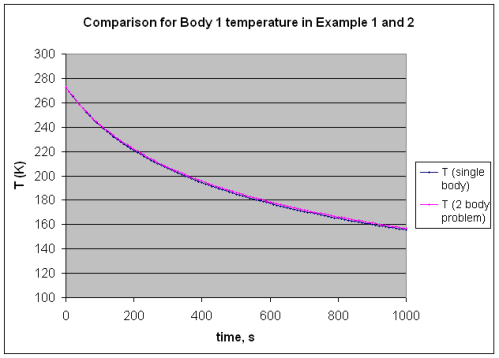 Emissivity and temperature determine the radiation from a body. Absorptivity determines how much incident radiation is absorbed. 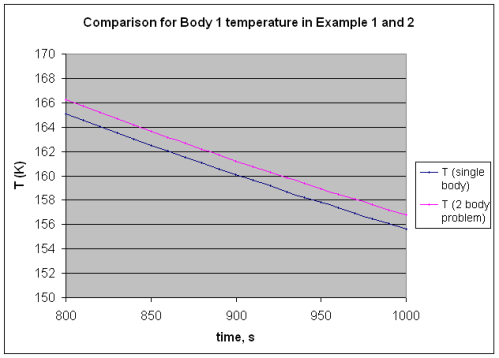 Therefore, elementary thermodynamics shows that a cold body can radiate onto the surface of a hotter body. And the hotter body will absorb the radiation – assuming it has absorptivity at that wavelength and direction. And once thermal radiation is absorbed it must heat the body, or slow down a loss of heat which is taking place. It cannot have no effect. This would be contrary to the first law of thermodynamics. First, the most likely mental image immediately conjured up is of two pots of water at say 50ºC. When these two pots of water are mixed together the temperature is obviously still at 50ºC. Second, the two stars are probably pictured as already in equilibrium at the original temperature. Well, if that’s the case then nothing will change. The change only occurs when they are brought closer together and so the mutual radiation from each has a slight increase on the temperature of the other. It’s just my guess. But what actually happens in the thought experiment probably isn’t intuitively obvious. When two bodies have an energy source which has created a constant surface temperature and they are subsequently brought into proximity with each other, there will be an increase in each other’s temperature. But no thermal runaway takes place, they just reach a new equilibrium. 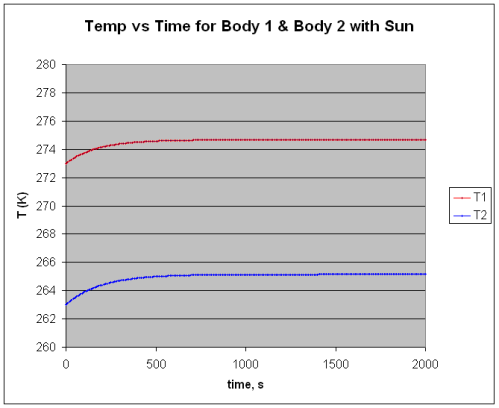 Basic thermodynamics explains that bodies emit thermal radiation according to temperature (to the fourth power) and according to emissivity. Not according to the temperature of a different body that might happen to absorb this radiation. And basic thermodynamics also explains that bodies absorb thermal radiation according to their absorptivity at the wavelengths (and directions) of the incident radiation. Not according to the temperature (or any other properties) of the originating body. Therefore, there is no room in this theory for the crazy idea that colder bodies have no effect on hotter bodies. To demonstrate the opposite, the interested student would have to find a flaw in one of the two basic elements of thermodynamics described above. And just a note, there’s no point reciting a mantra (e.g., “The second law says this doesn’t happen”) upon reading this. Instead, be constructive. Explain what happens to the emitting body and the absorbing body with reference to these elementary thermodynamics theories. 1. I said earlier: “If this star absorbs thermal radiation from elsewhere, it must emit more radiation or its temperature will rise. If its temperature rises then it will radiate more energy.” Strictly speaking when radiation is absorbed it might go into other forms of energy. For example, if ice receives incident radiation it may melt, and all of the heat is absorbed into changing the state of the ice to water, not to increasing the temperature. 2. Incident radiation can also be transmitted, e.g. through a thin layer of glass, or through a given concentration of CO2, but this won’t be the case with radiation into a body like a star. The total of reflected energy plus absorbed energy plus transmitted energy has to equal the value of the incident radiation. Where h, c0 and k are constants, T is temperature and λ is the wavelength. The Planck function describes how spectral intensity changes with wavelength (or frequency) for a blackbody. If the emissivity as a function of wavelength is known it can be used in conjunction with the Planck function to determine the actual flux.